Following a picnic lunch overlooking Vennford Reservoir, we continued our leisurely tour of the area. On the northern side, there was a gated exit leading to the road. But instead we took a sharp left, heading across country above the strip of coniferous woodland bordering the reservoir. 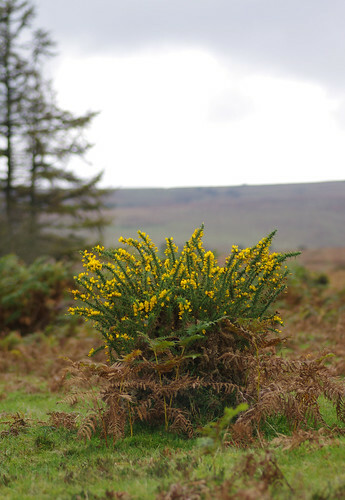 This species of gorse is more compact than its European counterpart. When the two grow together, the Western variety forms squat, rounded cushions and is towered over by the shrubby stems of the European. This specimen had no neighbours, a solitary island amidst the rusty, gradually encroaching bracken. As yet I haven't been able to identify these specimens. 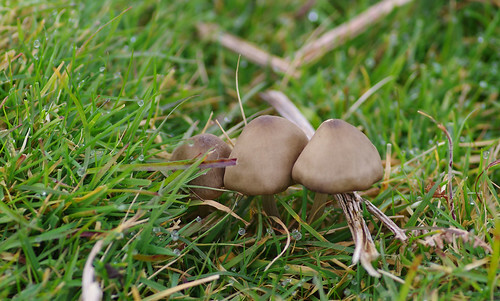 They were nobbly-shaped but had a smooth-looking surface. One thing that might improve our strike rate is a groundsheet - recently bought and ready for action. Now there will be no excuse to get down on the ground and look underneath at the gills. At this stage, our plan was to circumnavigate the reservoir, by going left and round, heading up to higher ground. But looking due south at the shining, silvery seam of water blocking the path, we were discouraged and changed tack. This is one of many species that grows out of dung or next to it. 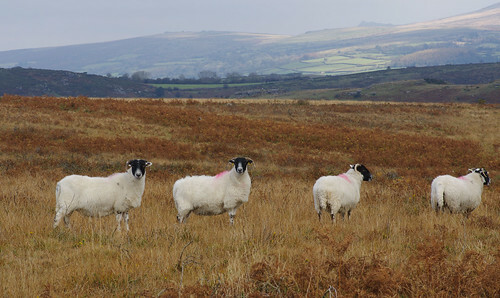 Because of the large number of grazing animals on the moor (cattle, sheep and Dartmoor ponies) these can be commonly seen in damp, autumnal conditions. 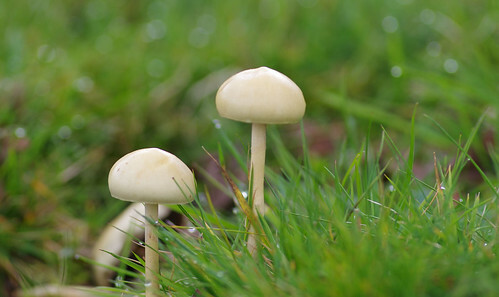 They were glistening in the dewy grass and impossible to miss. As we approached a small flock of sheep, Lady was straining on the lead. The two on the left regarded our collie curiously and looked like they would have stood their ground against any sheepdog. Sherry took a number of shots and this one came out best by far: the sheep are evenly spaced and I really like the way she has captured their different attitudes. Sheep are often wrongly characterised as dumb beasts who blindly follow each other. But with all species, the same rule applies: the more you observe, the greater your capacity to be amazed. Scottish Blackfaces are one of the commonest breeds of sheep in the U.K. They are hardy, used to rough terrain and able to survive in the roughest conditions. Being a bit self-conscious of the camera, sometimes I'm not keen on having my picture taken. But as with many other things in life, you have to be in the right frame of mind. 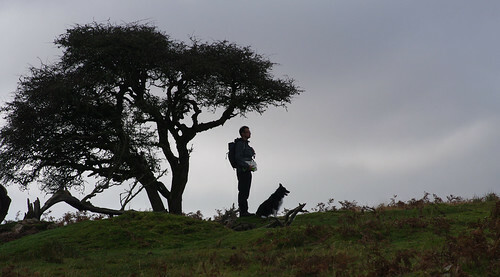 Lady and I had walked up to this hawthorn tree and were surveying the terrain ahead. Sherry called up instructions and we adjusted our angle accordingly. And it is from a flattering distance, at least! I can't be certain about the specimen above. It was growing betwixt grass and stone on the ground. The shape looks similar to Weeping Widow but you can't go on shape alone. Better luck next time, perhaps. These were in the same place and relatively easy to confirm. 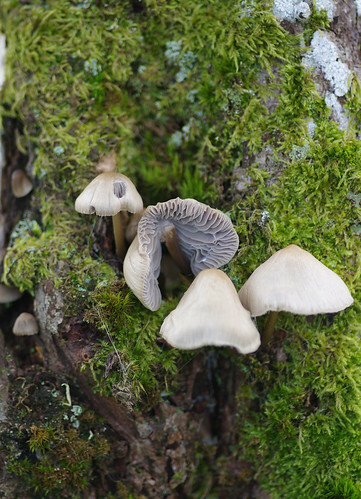 This species usually grows in clusters and has a distinctive colour. 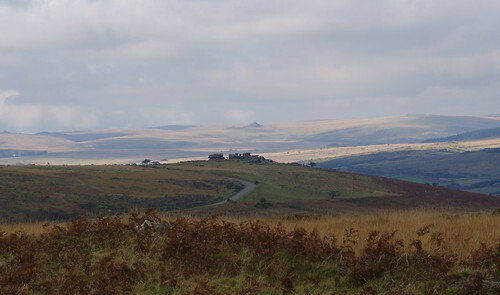 Combestone Tor is in the centre of the picture. We decided to meet the view in a roundabout way. 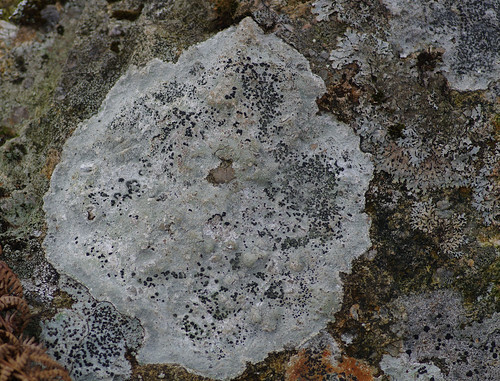 But first there was another dung fungi species to capture for posterity. The frilly edges (resembling teeth when the view is magnified) give this species its name. To the right of the main species, a lobed, reddish Parmelia variety can be seen. These rocks were at the foot of a hill near a stream. A couple ahead of us made a beeline for a pool and began washing their hair in the water. It's probably very good for the follicles and, being follically- challenged on the pate, I probably should have given it a go. But it also looked very cold and so we left them to it. By the stone footbridge, Lady had a splash to prove she was made of sterner stuff! These were growing on rocks by the stream. 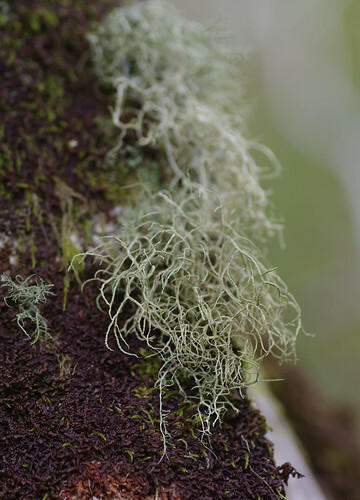 There is another tightly-plaited species which looks like a moss to the left. A few moments before, Combestone Tor was clearly visible. But as we proceeded along the path bordering the water downstream, the view had somehow disappeared. Consequently, the hill to Combestone Tor took a lot longer to ascend. We were very relieved when we could see our goal ahead. Nearer the tor, the ground changed and we were back on springy, grazed turf again, occasionally boggy in places. 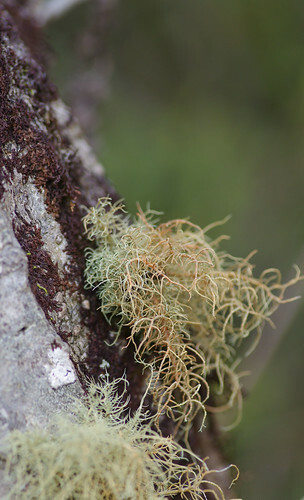 Among the jungle of mosses, this tiny specimen was waiting for us. 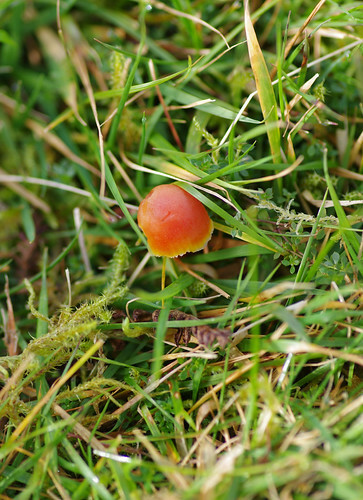 It is undoubtedly one of the waxcap species but I'm not sure which one. 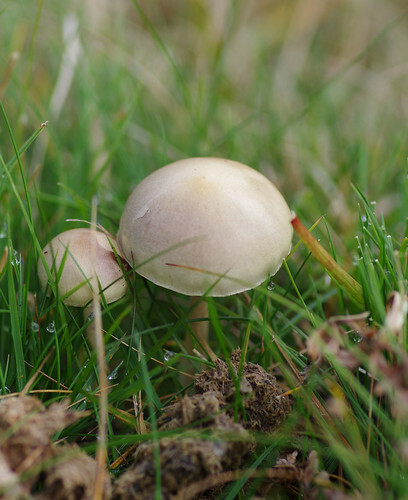 Immature Scarlet Waxcaps are sometimes paler, match the habitat conditions and are common at this time of year. 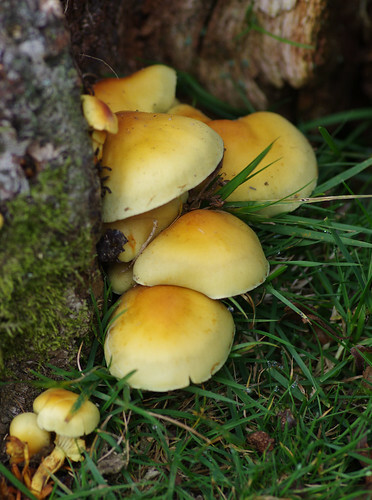 But other waxcap species could also fit the bill. 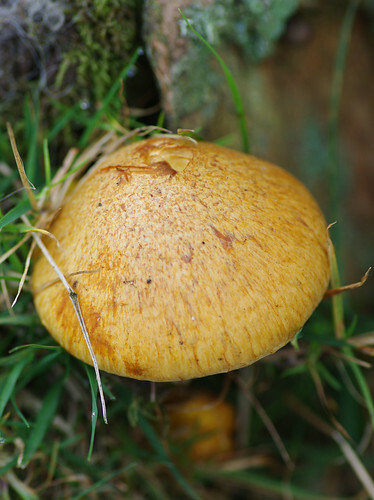 Could this one be an immature Blackening Waxcap - too young for the trademark burnt look? 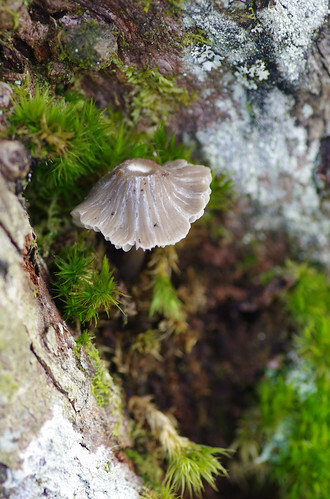 The mossy crevices of rocks and tree stumps were proving to be a mycologist's treasure trove. 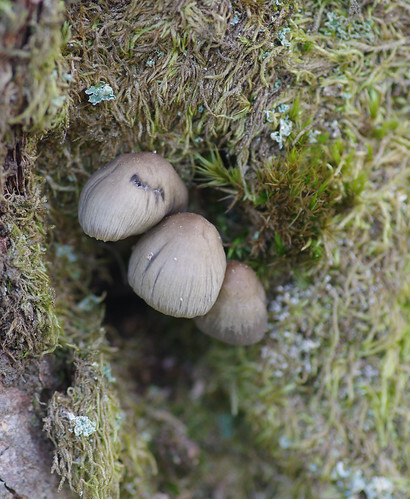 Note the pattern of the gills on the underside. They should have given me a clue but thus far the evidence is inconclusive. If I had to clutch a straw, I'd guess this could be one of the bonnets. 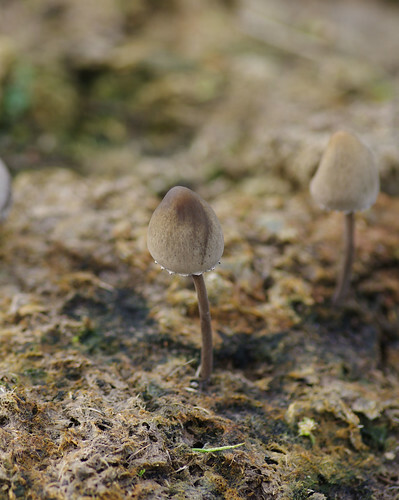 These three beauties could be Common Inkcaps. Whilst the oddly-shaped cap of this specimen gave me the biggest headache of all. I was sure the distinctive crown would be enough. Looking at the structure of tors is always rewarding. You can often see perilous combinations that look like they might topple faced with a gust of wind. Yet these strange, weatherbeaten shapes have withstood the ferocious onslaught of the elements for millenia. Leaving Combestone Tor behind, the time had pressed too far for further wanderings. We walked back along the road to Vennford Reservoir and the car beyond, with much to ponder. 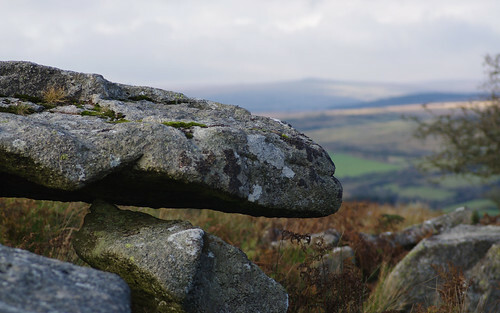 If you fancy following in our footsteps you will need an OS map of Dartmoor just in case. The landscape is inclined to play tricks on the senses, from time to time. Thanks to Jane Redman for joining us on this walk and being our extra pair of eyes.